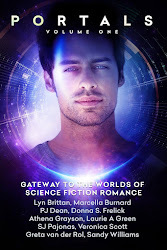 A group of bloggers and authors have teamed up this holiday season so you can enter for a chance to win a variety of science fiction romance ebooks—all for free! Thanks for doing this again this year. What an amazing group of writers! Thank you for this contest. What a great group of prizes! I'd love to win any of them in an ePub version. Thanks for the contest! This contest if so great, and hubby would love it if I could keep my spending down, lol. Thanks for hosting such fun prizes! I have a kindle, so pdf or mobi works great for me. Got hooked on Sci-Fi in college and 30 yrs later STILL lovin' it. You go girls! What great prizes! Thank you for the contest. What a great giveaway. Scifi romance has quickly become my favorite theme in romance. PDF is my EBooks format. My preferred format is ePub. Another great group of prizes. I love SFR! Thank you so much for having this blog hop again. It's always fun and I always expand my To Buy list. To whomever wins Diane's Blue books, you're in for a treat. I've read them both and they're good. I prefer epub but I can take pdf too. Thanks again! Merry Christmas, Happy Holidays! Everyone be safe. Wonderful contest! Thanks! EPUB or PDF it doesn't matter. Thanks so much for the chance to win these great books! Familiar with some of these authors but not all. PDF please.